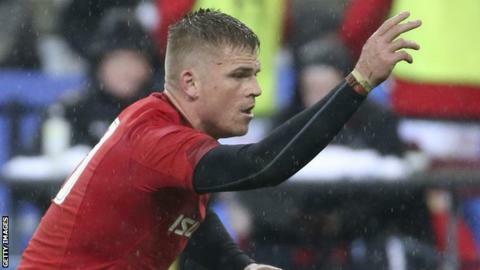 Gareth Anscombe has edged out Dan Biggar to be Wales fly-half against England in their crunch Six Nations encounter in Cardiff on Saturday. Wales coach Warren Gatland has also recalled Gareth Davies to partner Anscombe while Dragons lock Cory Hill takes over from Adam Beard at lock. Blues pivot Anscombe and Northampton Saints' Biggar have shared tournament starts against France and Italy. Scarlets' Davies is Wales' third starting scrum-half of the tournament. He has been recalled with Tomos Williams ruled out by injury and Aled Davies, who started in the win against Italy in Rome, on the bench. Ospreys lock Beard partnered Wales captain Alun Wyn Jones in Paris and Rome, but Hill's recall means he drops to the replacements. Leicester's Jonah Holmes makes way for Ospreys' British and Irish Lion George North while Hadleigh Parkes returns at Owen Watkin's expense. Rob Evans' return at loose-head prop means Nicky Smith drops to the bench while Ken Owens completes an all-changed front-row alongside the returning Tomas Francis. In Wales' back-row, only Josh Navidi remains as Ross Moriarty and Justin Tipuric are recalled with Aaron Wainwright and Thomas Young making way. Wales were also unable to consider Scarlets' tight-head prop Samson Lee and his Dragons rival Leon Brown because of injury. The hosts and visitors are the tournament's only two unbeaten teams and both have Grand Slam ambitions on the line. With Lee injured, Cardiff Blues' Dillon Lewis is back up to Exeter Chiefs' Tomas Francis at tight-head. Gatland said: "We are looking forward to being back at home and to build on those first two wins and to build on our performance. "We've had a great two-week lead-up to this game, we've looked really sharp and the squad are incredibly motivated to kick on. "It's a massive challenge playing against an England team that is playing really well and with a lot of confidence and we've got to make it difficult for them on Saturday. "We are looking forward to it and we know the Welsh fans are too and it's going to be a huge weekend in the Six Nations." Wales: Liam Williams (Saracens); George North (Ospreys), Jonathan Davies (Scarlets), Hadleigh Parkes (Scarlets), Josh Adams (Worcester); Gareth Anscombe (Cardiff Blues), Gareth Davies (Scarlets); Rob Evans (Scarlets), Ken Owens (Scarlets), Tomas Francis (Exeter), Cory Hill (Dragons), Alun Wyn Jones (Ospreys, captain), Josh Navidi (Cardiff Blues), Justin Tipuric (Ospreys), Ross Moriarty (Dragons).